Condensation on a window occurs when the surface of the window is cooler than the "dew point" temperature of air in contact with the window. Condensation is a result of a combination of surface temperature and moisture in the air. Window condensation is usually a wintertime situation, when outside temperatures are very low. Condensation can also happen during the summer, when outside air is very humid and inside temperatures are kept relatively cool. Winter condensation occurs on the inside of windows, while summer condensation occurs on the outside of windows. Summer condensation problems are mostly visual, whereas winter condensation problems can be destructive. Since outside window and building surfaces often get wet from rain, a little extra liquid water will not be detrimental. The condensation should disappear as outside air temperatures rise. Winter condensation though, can cause decay, mold and paint problems. 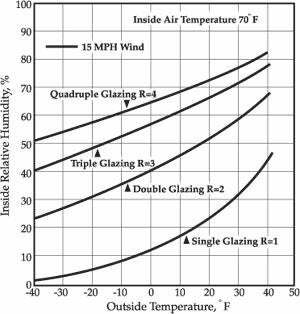 Several factors affect heat flow through a window and therefore the surface temperature of the glass, including inside and outside air speed across the glass, sun shine, sky temperature, inside and outside air temperature, and glazing types and treatments. Energy efficient windows and other window treatments reduce the amount of heat moving through a window system. Double pane glass, low E coatings and inert gas fill help to reduce the flow of heat. This reduced heat flow results in cooler surfaces on the cold side of the window and warmer surfaces on the warm side of the window. Winter condensation occurs when the inside surface of the window is cooler than the dew point temperature of the inside air. The dew point temperature is related to relative humidity. Condensation may occur under high relative humidity at only cool outside temperatures. As the outside temperature drops, the inside surface will also get cooler. Therefore condensation will form at lower relative humidity on cold days. The attached chart shows when condensation will occur for several window types at various outside temperatures and inside relative humidity. This chart is based on an inside temperature of 70F. The chart shows that condensation occurs at colder outside air temperatures with energy efficient windows, indicating that the inside glass surfaces are warmer than less efficient windows. To prevent winter condensation, either warm the window surface or dry the inside air. Options to warm the window surface include 1) opening drapes, 2) blowing air across the window surface, 3) replacing the window with a more efficient window, 4) adding storm windows, or 5) raising the temperature inside the building. To reduce the relative humidity in the room, control or eliminate moisture sources. People are sensitive to low relative humidity, so in extremely cold weather, the only option to prevent condensation may be to warm the window surface. Summer condensation occurs when the outside window surface is cooler than the dew point temperature of the outside air. In the southeast US, summer dew point temperatures range from about 65F to 75F. When temperatures inside the building are within this range, summer condensation problems can occur. The outside glass surface in energy efficient windows will be closer to the outside air temperature, while the outside glass of an in-efficient window will be closer to the inside temperature. Low-E coatings help reduce the amount of radiant heat transfer through a window. As the summer sun warms the outside glass, a Low-E coating reduces the amount of this heat that moves inward. (The outer glass can warm significantly in the sunshine. During the winter, the inside glass is warmer because of the reduced radiant heat movement outward, and you don't get that "cold" feeling sitting next to a window.) At night during the summer, heat is radiated from the outside glass to the cold sky and other objects. The Low-E coating reduces the heat transfer from inside, so the outside glass surface can cool significantly below outside air temperatures. In cases where the inside temperature is below the outside temperature, a Low-E coating will allow the outside glass temperature to drop to about the same as that of an inefficient window. In cases where the outside air is colder than the inside temperature, a Low-E coating allows the outside glass to get even colder. Therefore under the right conditions, windows with Low-E coatings can develop more summer condensation than inefficient windows. Since we cannot control the outside dew point temperature (or relative humidity), the options for preventing summer window condensation problems are to warm the inside surface of the window as a way to warm the outside surface. Raising the thermostat setting is about the only option. Exterior shutters, shades or even trees can help reduce summer condensation problems as well. The following chart indicates the conditions where windows may start to show condensation. Based on an outside temperature (and assuming the inside temperature is 70 degrees F), condensation could occur at any indoor relative humidity higher that that shown for that type window. For example: The bottom line shows a single-pane window. If the outside temperature is 30 degrees, condensation would for whenever the inside relative humidity is greater than about 32%. In contrast, if the window was double-glazed, condensation would not occur on the window until the RH was higher than about 58%. At 10 degrees outside, condensation will not occur on a single-glazed window until the indoor RH is above 17%, while for a triple-glazed window, the indoor RH would have to be above 62%.